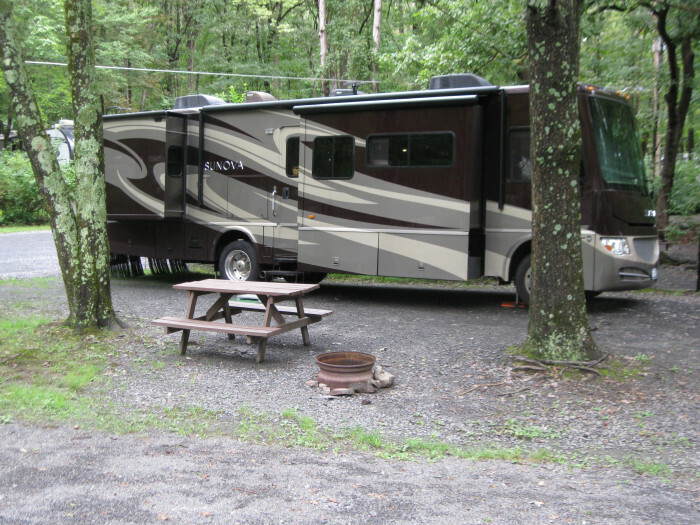 Ask fellow campers about "Mountain Vista Campground" and nearby attractions. Stayed 16 nights to visit family in PA and NJ. 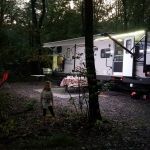 Family owned campground with great service and friendly staff. Hilly and gravel roads, we had quite a bit of rain while there. Didn't use any of the amenities. Site B15, large enough for our 43 ft bus and toad . 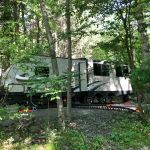 We camped at Mountain Vista Campground in a Motorhome. The park is 6 miles off I-80 and a little difficult to find. Their website does not have directions, you have to scan an app on your phone, which I don't have. The locals roads are hilly and narrow, especially the trees are intruding on the roadway. Once at the park, you have a steep climb to the office. The office stall was friendly and helpful, and the site was easy to find. This campground was cut out of a forest on the side of a mountain, so there is little level terrain. The interior roads are gravel and a little tight and the road to the P section has a serious dip. The sites are pretty level at the rear, but that is where the hook-ups are so it worked out. 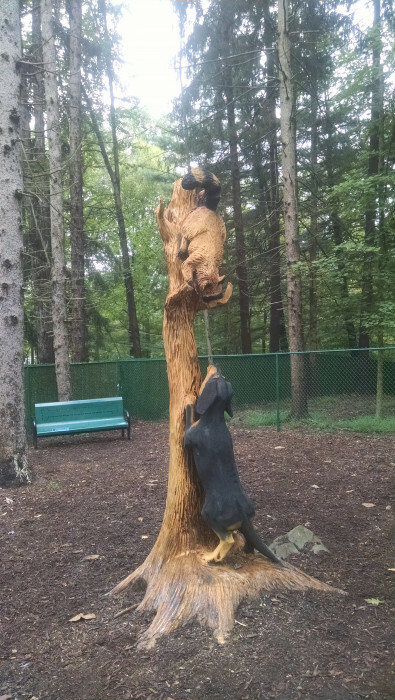 A number of the dead trees in the park were carved by local artists and are something to see. The cable TV is great with many analog channels. The WiFi was also excellent. Water pressure was good and the voltage steady. The sites are rather close but it is so wooded you don't see your neighbor. I was happy with our stay there and would return given the opportunity. We camped at Mountain Vista Campground in a Motorhome. The Delaware Water Gap is the major attraction in the area. Pocono Raceway is not too far away. The park has lots of trees and is almost like a state park. Some sites are ample and some are tight. We are 42 feet long with 4 slides and barely fit in our spot for a 2 month stay. It was very unloved. We reserved about 6 months in advance. There are a few 50 amp sites, mostly 30 amp and most sites are occupied by seasonal. The roads are bumpy, rutted and gravel. Unless you have a pull thru, plan on lots of backing and filling. Owners are very accommodating and very sweet. They even have a herb garden to share. They seem to cater to the seasonal, so if you have a problem with one of the seasonals, noise levels, etc....it probably won't be addressed. Good place for families...not a good overnite stop. If you are larger than 40 feet, I would consider looking elsewhere. We camped at Mountain Vista Campground in a Motorhome. A clean, well-maintained park in a hilly area. Slight slope to most sites but easy to level. Good hookups, sewer old style non-threaded requiring rubber doughnut. Good cable, local channels plus NY and Philly sports teams. Gravel roads but not dusty. Lots of activities for kids, including fishing pond and panning for "gold". Moderate sized very clean pool. Small store with basics, bread/milk etc. Easy check in, friendly staff. Nature/fitness trail a plus. Only saw one other couple besides us without at least one dog. The RV across from us had five dogs in an outside pen, but the owners were attentive to quieting them when necessary. 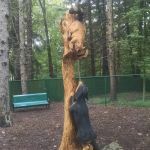 During the day we could almost always hear barking from one location or another in the park, but it was just background noise and not a deal breaker. CG is extremely quiet at night and we were there over a weekend. Heavy rain did not stop numerous campfire lovers from trying to burn wet wood. Enough smoke that we closed our windows and went with air conditioning the second night. A decent breeze and dry weather would have eliminated the issue. Overall this was a pleasant camping experience and we would certainly return. We camped at Mountain Vista Campground in a Motorhome. Nice family campground in the Poconos. Friendly staff and owner is on site. Roads are gravel and a bit tight in some spots for a big rig, but certainly manageable if you take your time. They have lots of things to do and everything is kept clean. Water, sewer, electric, and cable all worked well. WiFi was usable and good Verizon 4G. Sites are mostly level with a slight grade. Plenty of trees. Nice place for a couple nights or a week. Give it a try! We camped at Mountain Vista Campground in a Motorhome. Heavily wooded park near Stroudsburg. Nice owners, decent sized lots, relatively level, and large pool. Nice games and free equipment (kids really liked playing ping-pong, tennis, also had a number of other games including giant connect 4...). Small pond for fishing, although we had no luck :-( . Scavenger hunt, bingo. Stayed there on Labor Day weekend - which even though it was very busy it was relatively quiet. Lots were crushed stone (no grass due to wooded area). Be aware that it is hilly - small children may have difficulty riding bikes. Why not higher rating? I base a point down for some of the following, which get higher marks on my other reviews. Unpaved roads (crushed stone), bathrooms not modern, bathrooms not particularly clean (checked a few times - including after their cleaning time), water pressure was very low at times - barely a trickle during morning of last day, seasonals not particularly well kept/landscaped, firewood purchased there was wet. Bottom line is we had a nice time, and would go back again. However even a 7 is a little high (since we liked the owners...) when compared with other places we have stayed. We camped at Mountain Vista Campground in a Motorhome. Nice campground with lots of shade trees and very woody setting. Sites were nice size; cable TV very clear with good channel selection; wifi was very good on clear days, but unusable on rainy days. Grounds are very close to beautiful hiking in Delaware Water Gap Park. Cons: heavy automobile traffic through campground on weekend from permanent residents. We camped at Mountain Vista Campground in a Motorhome. Beautiful place with shady level sites carved in the side of a mountain. Utilities worked great for us, 50 amp was clean. Only stayed two nights as I'm traveling through. Will stop again. We camped at Mountain Vista Campground in a Motorhome. We found this to be a great campground during a very hot spell. We elected to stay an additional night to enjoy the welcome shade. W/S/E were very good. Found no problem with electric with constant AC use. WiFi was strong and we found that the access codes worked until the time we had arrived the previous day. After registering for another day we found the access still working at check out. The public roads to reach the campground do have some tree branch issues, but traffic was light. A side note - cash only at check-in. However, ATM on premises charges $1.50 service charge, which trumps most banks. We will return. We camped at Mountain Vista Campground in a Motorhome. Heavily wooded hillside campground, built into hill on tiers, overlooking woods. It's so wooded there is no sun. Gravel roads, a little tight but no problems, good cable. We used it as an overnight stay. Many sites were occupied with long term trailers, but most were neat. We camped at Mountain Vista Campground in a Motorhome. Very nice, heavily wooded, hillside campground. Very peaceful even over Labor day weekend. Gravel access roads with somewhat level sites. No problems maneuvering within campground (37' plus toad), but we dropped our toad at the entrance. Entry road (Craigs Meadow) not trimmed side or top for large rigs - driving down the middle of the road necessary to avoid side scrapes and to minimize top scrapes. Power a bit low - 115v under load; water pressure very low (20 psi); sewer connections not threaded and some are slightly uphill; WiFi OK, but can be slow and is not available the morning of your departure; cable OK (sat not useable). Long list of restrictions on electric usage including no electric hot water, no washer / dryer usage. Washer / dryer restriction is due to being on well water. They are willing to waive this restriction outside of peak season (i.e. when they are not mostly full) - ask at office. We will stay here again when in the area. We camped at Mountain Vista Campground in a Motorhome. Good size sites, mostly shaded. Access to our site was very easy, although there are a few sharp turns that would be tricky for a large RV. Campground was very well maintained. Campground owners and employees were all very friendly and helpful. There is plenty to do, both at the campground, and in the surrounding area. This place is worth a visit, and we will be going back later this summer. We camped at Mountain Vista Campground in a Motorhome. We stayed here one night on our way home from NC. This is a beautiful park, with excellent hookups, including Wi-Fi. Our site was level, roomy, and the location well thought out to allow for the most privacy. It rained all of the time we were there, so we did not have an opportunity to use the facilities, but this is a full service park with lots of amenities. The staff was pleasant and helpful. We would stay there again. One note - cash or check only. We camped at Mountain Vista Campground in a Motorhome. Nice clean park. Well kept and maintained. Lots of hills and trees with the sites close together. Don't expect satellite, but cable TV was available. Best suited for Class C's and travel trailers. Lots to do and a good place for kids. Many activities. We camped at Mountain Vista Campground in a Motorhome. We used this park for only one night. Sites are very close to each other; roads poor all around. Good Wi-Fi. We would not travel here again We camped at Mountain Vista Campground in a Motorhome. Great flea market down the road. Also be sure to check out Bushkill falls. Many attractions in the area, Delaware water gap is a quaint and charming town. Many canoe and kayak rentals in the area. 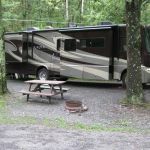 Are you affiliated with Mountain Vista Campground ?